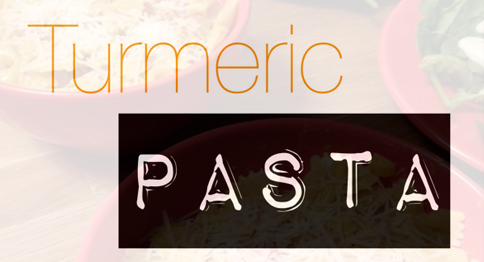 For a meal I could eat pretty much every day of the year, I'd turn to Turmeric Pasta. The recipe that I have was passed down to my husband from his parents on a print out in Courier font. We kept that trusty paper around for years before we finally typed it up (in Courier font) and placed it safely on our USB drive where it lives today. To ensure that recipe (and our drive) stands the test of time, I'm putting it up on the blog so I can always find it. I have no idea where the original recipe came from (actually I may update this because now I'm recalling a vague memory of my Mother in Law telling us she saw it on a cooking show in the 80's or 90's and then wrote it down to the best of her memory - buuut that could have been a different recipe.) San regard, I did a Google search and couldn't find anything similar so there. You know when you're grocery shopping and you suddenly have that desire to make your favorite dish and your grocery store has no service so you're forced to recall all the ingredients by memory? That's one of these dishes. Luckily Matt and I were shopping together last night so we could tag team this one. He's been on the no-carb wagon for months so we haven't made this recipe in far too long. It's a good thing we were both there or else someone would have been trekking out again for the light cream. It's always the light cream I forget. Want to feel even better about your choice to indulge in Turmeric Pasta? Did I mention the health benefits of Turmeric? Known for its anti-inflammatory properties, Turmeric is associated with taming heartburn and upset stomach, warding off heart attacks, delaying diabetes, and even fighting cancer! Like what you see and want to save it for later? Hover over the image below to Pin!